You know how when something very strange happens and it’s so weird, you just don’t want to tell anyone? Not even your mom? That happened to me about 10 times a day while I was pregnant. Thankfully, once I got the nerve to open up about what was happening, I learned that those weird things my body was doing? Totally a thing for pregnant women. Did you know many women develop carpal tunnel syndrome while pregnant? Sometimes it emerges during breastfeeding…and sometimes it can linger until Baby weans. Many women experience numb hands or “the dropsies,” where no glass of water is safe from tipping and no jar lid can be unscrewed. The hospital where I had my boys has written a really helpful article about pregnancy-induced carpal tunnel. Check it out for some great suggestions. The only time in my life I sweat more than during pregnancy was right after my babies were born! I can’t tell you how many times I woke up just soaked in sweat such that I had to change the sheets. Fear not! Along with many other gross-seeming symptoms that pop up during pregnancy, excess sweat is just something that happens during those 40 weeks. I know it seems sort of obvious, since we expect that a baby is going to lower itself down toward the pelvic floor and push its way out of there, but I was taken aback by pelvic pressure. Even early on, I noticed just a ton of, well, pressure! It sometimes felt like I was walking around with a bowling ball between my legs. We basically are when we’re pregnant, but intense pressure can be super uncomfortable. A support belt can really help with this. Listen. You might not take a normal poo the entire time you are gestating that baby. The progesterone your body is producing might bind you up tighter than a mummy. This happens. Many, many pregnant women rely on Colace, although you might find that really going to town on dried fruit and ground flax can help you over the edge. Each time I was pregnant, one of my first signs was an intensely heightened sense of smell. I was teaching Freshmen Comp at the time, and I remember, vividly, yelling at my students, “Who is sucking a butterscotch? Who is it?” I actually asked the timid young man in the back row to go in the hall and spit out his candy, the smell of which overwhelmed me from 40 feet away. Also: breath. People’s breath bothered me for 9 months, each time. So, you’re not crazy. You’re just pregnant with a sensitive nose! And you’re not alone. 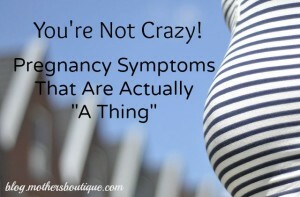 Did you have any odd symptoms during pregnancy? Leave us a comment to share your experience! Wow, for the first time I’ve seen a pregnancy symptom that comes even a LITTLE close to mine! Barbara said that she didn’t like the color blue, well I CANNOT STAND certain outfits of mine and my daughter’s that I adored just a month ago before I knew I was expecting. It is SO WEIRD. I definitely have a heightened sense of smell as well and every little thing agitates my already lingering nausea, including certain dresses of mine and my daughter’s! It is so aggravating! Now I am very limited to what I can dress my daughter and me in without getting sick! I don’t even like certain nail polishes anymore! I went through this only slightly during my pregnancy with my daughter- I gave a couple of tank tops to my sister because I no longer liked them, but this is WORSE! By the way, I can also relate to # 23 as well…. my daughter is 4 years old and even though she’s usually clingy to Mommy :), her clinginess has increased TREMENDOUSLY! Last time her daddy and I tried to go out, she had a FIT to the point where we stayed home. My mom was going to watch her and she didn’t understand it- until I told about a week later that I just learned I was expecting, then she remembered that saying and said that she should have suspected that I was pregnant because of that!